Albuquerque resident Lyle Hale recently took a flight from Nashville to Phoenix. En route, the plane flew over New Mexico between Albuquerque and Santa Fe. 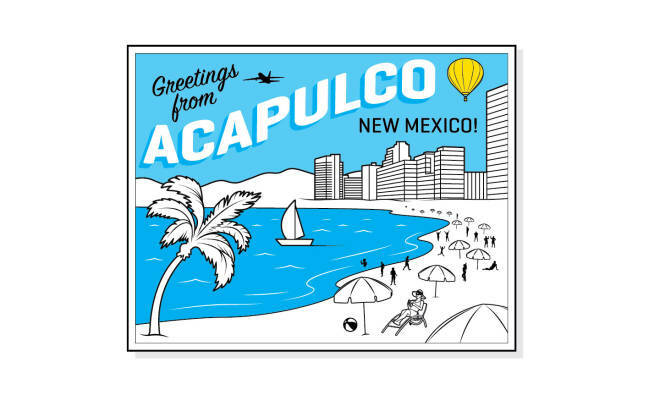 Looking out over the high desert and mountain landscape, he turned to the passenger sitting next to him and said, “That’s Albuquerque, where I live.” When she replied, “Oh, is that near Acapulco?” all he could manage to say was, “Yes. Yes, it is,” as they continued their southwesterly trek toward Phoenix. Brenda Trujillo, of Española, was confused by an overage charge on her AT&T bill. “I have unlimited talk, text, and data, so that didn’t make any sense,” she said. Further research revealed that two calls to her Abiquiú mother-in-law were shown as going to Samoa and two to her stepson on a Santa Fe number were “Russian Federation.” Nyet, she said to paying either one of them. Numerous readers alerted us to a national website that recommends local repair shops for various appliances. No matter the brand or the New Mexico city, service-center -locator.com says “New Messico.” The site has an email address to report “incorrect addresses.” We figured this counted, so gave it a try. Big surprise: Our message bounced. Late last year, attorney Peter Sabian told a Florida co-worker that he’d found a new job in New Mexico. “Oh, great,” she replied. “Where will you be moving to? Mexico City?” Welcome, Peter, to your first “Missing” moment, and to wiser colleagues in Alamogordo, USA.